BANKRUPTCY-CHAPTER 13,DIVORCE-CHILD SUPPORT,DWI-CRIMINAL,TRAFFIC, AUTO ACCIDENTS. 29 years experience. Licensed in Missouri and Illinois. I handle Divorce & Child Custody Cases, DWI and Criminal Defense, Bankruptcy and Chapter 13. I am licensed in Missouri, Illinois, and the Federal Courts since 1985. With over 25 years experience, I have handled most of the legal issues that the average individual is likely to encounter from Auto accidents and Bankruptcy to Wills, Workers Compensation and Probate. I have handled hundreds of Bankruptcy cases, trials, hearings, depositions and all phases of litigation. I want to be your personal lawyer. Contact me whenever you need legal advice or representation. If I don't handle it, I will refer you to someone trustworthy who does. We are conveniently located in Clayton, Missouri, 2 blocks South of the St. Louis County Courthouse. Our office is at the intersection of Meramec and Forest Park Parkway across the street from the Clayton Metro-Link Station. We serve the entire Metropolitan St. Louis Area - including St. Louis, St. Charles, Jefferson and nearby counties in Illinois. FREE CONSULTATION. We will spend up to an hour with you developing a specific strategy for your situation, no strings attached. We charge a basic Bankruptcy fee of $1206.00, INCLUDING ALL COURT COSTS, for a personal Chapter 7 Bankruptcy. A $100 discount will apply for single filers who are below median income and have fewer than 20 creditors. Payment plans are available since many of our clients are unable to pay the entire fee up front. The Flat Fee for Chapter 13 bankruptcy is established by the Bankruptcy Court in the Eastern District of Missouri. Most of the fee is paid over time through the debtor's chapter 13 payments rather than up-front. The total fee over the entire plan period may not exceed $4000.00 without fee application and court order. The attorney's fee in a Chapter 13 is an administrative expense and (to a great degree) is paid at the expense of the creditors. The fee covers all legal services through the conclusion of the case. A chapter 13 is a reorganization where you can adjust your debts, keep your property, and avoid foreclosures and repossessions. A chapter 13 can also be used to pay Debts to the IRS or other taxing authorities over time and avoid some interest and penalties. A chapter 13 plan lasts between 36 and 60 months, dependent upon your situation. Most chapter 13 debtors pay only a fraction of their actual debt. Divorce and Family law cases are usually handled on an hourly basis. For uncontested divorce I will quote a flat fee, if requested. NOTE: MOST UNCONTESTED DIVORCE CASES CAN NOW BE HANDLED WITHOUT A COURT APPEARANCE. Fees for DWI and alcohol related traffic offenses and suspensions are determined on a case by case basis, depending on the complexity of the case and other factors. Our hourly rate is $175.00 for most matters. 9:00 a.m. to 5:30 p.m. Mon - Friday. Other hours by appointment. Over 25 years handling Bankruptcy, Chapter 13 and Consumer Debt Relief case. Licensed in Missouri and Illinois. Serving the entire Metropolitan St. Louis Area. I have helped hundreds of individuals and small business manage and discharge their debts under the Federal bankruptcy laws. I have helped my clients stop garnishments, avoid foreclosures, and stop creditor harassment. I have successfully managed my practice in the same location in St. Louis County since 1992. I would be happy to help you address your particular debt situation. We provide high quality legal services with integrity at a fair price. We are the trusted lawyer for hundreds of individuals and small businesses. Licensed in Illinois since 1984. 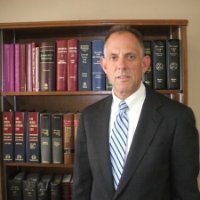 Licensed in Missouri since 1985. Memberships include: Missouri Bar Association, Illinois Bar Association, Debtor Attorneys of Metropolitan St. Louis, Solo and Small Firm Section of the Missouri Bar, Christian Attorneys of St. Louis, St. Louis Track Club, Alpha Phi Omega National Service Fraternity, Volunteer Lawyer - Legal Advocates for Abused Women. Pulled Over - Do You Blow?